The Most Valuable Student scholarship contest is open to any high school senior who is a US Citizen. Applicants will be judged on scholarship, leadership, and financial need. Applications for the contest are available after September 1. 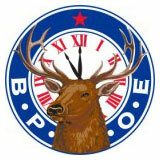 The application must be submitted to the Elks Lodge nearest to the applicant’s home by December 4. Applications must be submitted to the Elks Lodge closest to the student’s permanent U.S. address. Applications must advance through local, district and state competitions to reach national judging. At each level of judging, the Elks National Foundation Scholarship Office will send email notifications to applicants informing them if they advanced in the contest or not. The first round of email notifications will be sent in mid-January, after Lodge judging is completed. District judging will be completed in late January, and State judging will be completed in mid-February. Contact your local Elks Lodge for more information.